through three state case studies of Oregon, Florida, and Missouri. practices, and procedures that compound disproportionality. 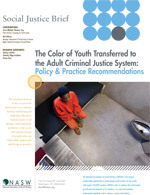 Children Being Tried as Adults: Pre-Trial Detention Laws in the U.S.